Texans pride themselves on their big state, even taking pride in their big rattlesnakes. Only Arizona has more of these venomous critters. Where else can you find "The World's Largest Rattlesnake Round-up," with a cook-off to boot? Fried and barbecued rattlesnake aside, you can find live rattlers in every part of Texas. Only three varieties of Texas rattlesnakes usually attack humans. Protect yourself when out walking by wearing boots. 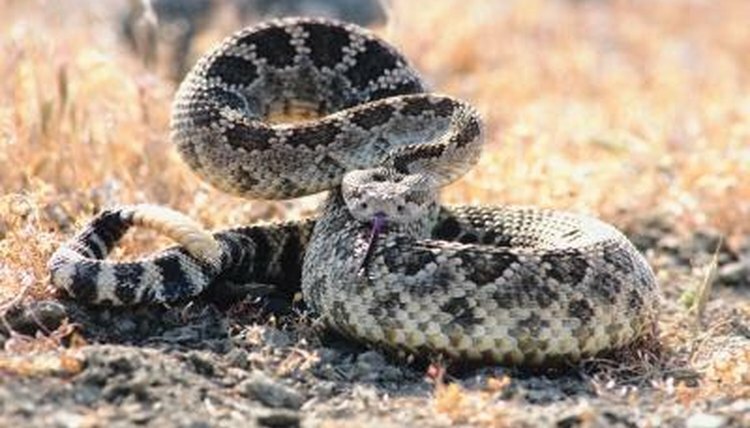 According to the South Texas Poison Center, Texas is home to eight types of rattlesnake. These include the western diamondback rattlesnake, timber rattlesnake, prairie rattlesnake, Mojave rattlesnake, blacktail rattlesnake, western rattlesnake and pygmy rattlesnake. It's the first three that primarily attack people. Rattlesnakes are pit vipers, as are water moccasins and cottonmouths. The STPC estimates that 99 percent of all venomous bites are from pit vipers. Although there are quite a few species of rattlesnake in Texas, the western diamondback (Crotalus atrox) accounts for the overwhelming majority of serious venom poisonings, according to the Texas State Historical Association. The "atrox" in its Latin name means "savage" or "grim" -- so the snake is quite appropriately named both in English and Latin. The base color of the western diamondback ranges from yellow to reddish tan to gray or brown. Only some of them, however, have the diamond shapes along their vertebrae from which they get their name. Although western diamondbacks might vary in appearance, they all have black and white bands on the tail. It's the biggest snake in the state, with some specimens stretching to 7.5 feet, not including the rattle. The western diamondback's territory encompasses the western two-thirds of Texas. Second in size and number in Texas is the timber rattlesnake (Crotalus horridus). You don't need to know much Latin to figure out the species name. Their bodies are yellow, gray or a greenish hue with rust coloring along their backs, with a black rattle and an average length of 3 feet. Texas Parks and Wildlife describes the timber rattlesnake as having "20 to 29 dark, V-shaped crossbars with jagged edges" forming a distinctive pattern across the back. The timber rattlesnake isn't as quick to defend itself as its western diamondback cousin. Because they prefer woodlands, as their name implies, as well as wet areas, timber rattlesnakes live in the eastern third of the state. The medium-sized prairie rattler (Crotalus viridis viridis) lives primarily in the Panhandle, but can also be found in the Trans-Pecos. The front of its body contains round, brown blotches with dark edges along the vertebrae, with crossbars on the back end of the snake. The tail has tan and brown bands. This snake averages between 2 and 3 feet long. Texas Parks and Wildlife warns that the prairie rattler's behavior is unpredictable, as some might strike readily while others try to escape when coming into contact with a person. Rattlers breed in autumn and spring in the Lone Star State, with females giving birth to live young six months later. There's no parenting in rattlesnake life -- the babies are on their own to find food as soon as they're born. It takes about three years for a rattlesnake to reach sexual maturity. Female rattlers don't breed every season, but roughly every second or third year.